This is the strait that is located between Kri and Mansuar island. There are a lot of species of marine creatures that I see here including wobbegong, diagonal sweetlips, black-tip reef shark and hawksbill sea turtle. The current here is strong here. There is Mangrove homestay near Yenbuba village which visitors can choose to stay. The nearby Mangkur Kodon located at the beach of Kri island is also a nice choice for visitors who want to enjoy scuba diving, snorkeling and freediving in Yenbuba strait. Although the coral reef here is not the best in Raja Ampat, Arborek is one of the most popular destinations in the archipelago. Visitors who have just seen Piaynemo islands often stop here to enjoy snorkeling or a short village tour before going back to Sorong city or resorts and homestay. The coral reef is similar to other places in Raja Ampat but there are several giant clams (Tridacna gigas) on the shallow water west of the village's jetty. This white sandy beach is located at a small uninhabited island in the eastern most tip of Waigeo. Because of its remote location, very few people know its existence. The coral reef in this island is in pristine condition. Small and big tropical fish can be seen here including parrotfish, sweetlips, grouper, bluefin trevally, humphead wrasse, reefshark, and turtles. There are sea stars, sea cucumbers and a lot of species corals. 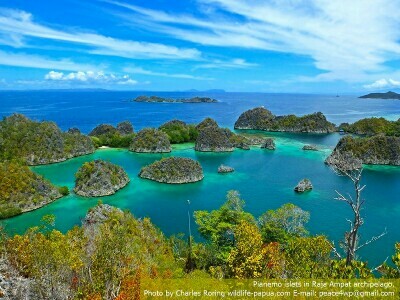 Wayag is the most popular destination in Raja Ampat for visitors who want to see beautiful landscape of karst islets that look like a group of emerald gemstones on the surface of turquoise sea water. Pristine coral reef can be explored here. The western area of Mansuar island - both beaches that face Gam and Batanta have got very beautiful coral reef spots that are rich in Marine Life. I have enjoyed snorkeling and freediving in those areas with some visitors. Unfortunately, the reef flats around the jetty of Sawondarek have been badly damaged due to the movements of speed boats during low tide period and strong waves that land on the beach. 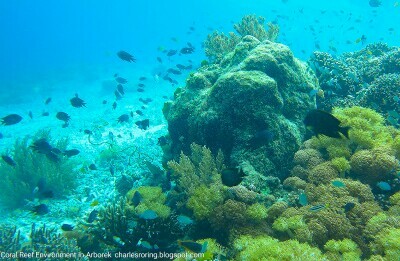 However, the coral reef in the buttress zone or fore reef area is still in very good condition. Barracuda, Giant Trevally (Caranx ignobilis), Black Tip Reef Shark, Grouper, Parrotfish thrive in that reef area. There are several coral reef areas in Piaynemo islet group. The famous ones are Melissa's garden. Barracuda, and Galaxy. However, when I went freediving with some Czech visitors to a small island across from the entrance of Piaynemo, I found that the coral reef in the area was also in very pristine condition. Gam island has got a lot of coral reef sites which snorkelers, scuba divers and free divers can explore. I highly recommend Citrus Ridge, and Mangrove Ridge. 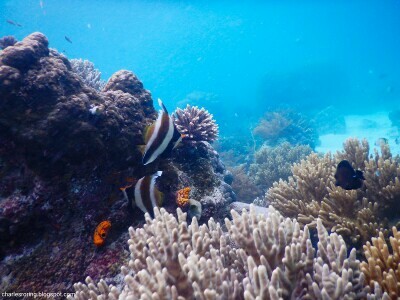 There is Yeben Kecil island whose coral reef is very beautiful and rich in fish both big and small. Most often the current is very strong.